MacBooks are notorious for overheating - although there is a plethora of information out there how to fix this issue, most of the suggestions are either "Take it to Apple Care" or reset SMC.... 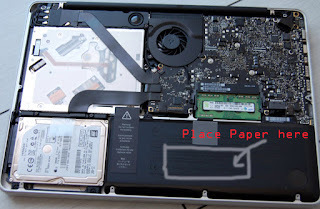 In this post I am going to help you fix it for real, especially if it is a MacBook Pro 2010 in which case it is likely to be a hardware related issue. Problem 1 - If it overheats than there must be a hardware issue! Problem 2 - MacBook overheats for no apparant reason even if it just sitting on your lap! Problem 3 - The fans are whirling and creating lots of noise! Problem 4 - The system runs sluggish when there is the overheating! So let's tackle the sluggish issue first - I know it is a bit like cheating, but we will get to the root of the problem soon! Why does the MacBook run terribly slow during an overheat? Some of you may have fired up the Activity Monitor and noticed a process called kernel_task taking high CPU, sometimes even 400% !! So what is happening here? Basically OSX has a kernel module called ACPI_SMC_PlatformPlugin that regulates the kernel and user processes to prevent overheating by trying to minimise the CPU cycles and system activity. This is done by constantly monitoring the temperature and inputs this information in a negative feedback system - the higher the temperature, it will tell the CPU to slow things down..you know..to chill a bit (that was good eh!). The result is this: MacBook will still overheat for now, but at least will not cause the whole system to run super-slow and collapses your mental sanity. GOOD! Now let's go to the hardware fault - I will talk about my experience but you can use the same troubleshooting and fix for your particular problem. So my MacBook was giving me trouble from day 1 - everytime I lay it down on my lap it will overheat in a few seconds. If I put it down on a couch, it will do the same. So I used to think that MacBooks in general do a terrible thing in compromising practicality for the sake of running sleek. However one day I noticed while adding a RAM module that if I press on the RAM, the MacBook will suddenly overheat - so I started replicating the problem to be 100% sure - I was pressing down on the motherboard to make sure that it was just the spot on the RAM that was causing the issue. Further research gave me more insight and appeared to be a common problem!